For Alice Keppel, it was all about appearances. Her precepts were those of the English upper classes: discretion, manners and charm. Nothing else mattered – especially when it came to her infamous affair with King Edward VII. As the King’s favourite mistress up until his death in 1910, Alice held significant influence at court and over Edward himself. But it wasn’t just Edward she courted: throughout her life, Alice enthusiastically embarked on affairs with bankers, MPs, peers – anybody who could elevate her standing and pay the right price. She was a shrewd courtesan, and her charisma and voracity ensured her both power and money, combined as they were with an aptitude for manipulation. 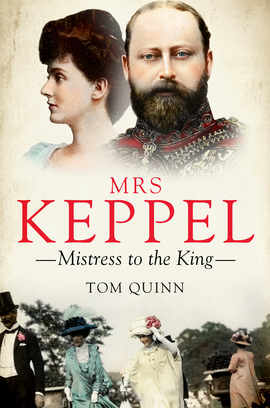 Drawing on a range of sources, including salacious first-hand eyewitness accounts, bestselling author Tom Quinn paints an extraordinary picture of the Edwardian aristocracy, and traces the lives of royal mistresses down to Alice’s great-granddaughter, the current Duchess of Cornwall. Both intriguing and astonishing, this is an unadulterated glimpse into a hidden world of scandal, decadence and debauchery.